I’ve had two weddings in the past month so I did two back to back GEL manicures. If you are not familiar, while GEL manicures last 2 to 2 and a half weeks they wreak your nails or at least they leave my nails paper thin and unattractive. So I just took off my GEL a few days ago and went back to regular polish. I mentioned my favorite base and top coat by Sephora, called Sephora X a few weeks ago, but another GEL alternative just came across my desk that is 4-Free and claims to do the same thing, which is give you gel like shine and super staying power of your manicure aka less chips. So since I love green alternatives I thought I’d give it a whirl. Read what I thought after the jump. 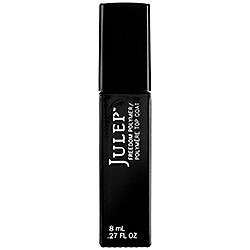 With the Julep Freedom Polymer Top Coat, its only one step as opposed to two as with the Sephora X, but you still need a base coat so in the end its the same process. I noticed no amazing shine, but my nails did look good. The lack of super shine could have been the polish, but still no super shine, it looked just like a regular manicure. In terms of wear, on day two three fingers chipped, so this stuff is decidedly NOT like the Sephora X that I love so much. I’ll try it with another polish next week and update y’all and see if its a polish issue, currently I’m wearing FLOWER BEAUTY nail polish.